One of the most charming restaurants in the central business district, The Lighthouse Restaurant (perched atop the Fullerton Hotel) is an exclusive Italian restaurant with a mere nine tables, commanding a breathtaking view of the Singapore waterfront and the Marina Bay Financial District. Few might know that the dining room used to be a functioning lighthouse that guided ships safely to the pier, hence the name. In its present life, The Lighthouse Restaurant is a beacon of fine southern Italian cooking. Chef Carlo Marengoni holds court with specialities and quality produce from Campania, Sardinia and Sicily. 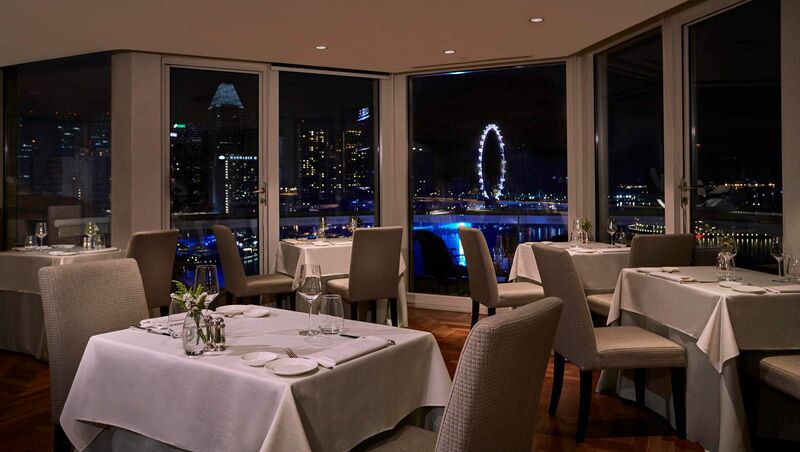 Before or after dinner, there’s also a rooftop bar above the restaurant where one can enjoy an aperitivo or a post-prandial drink while taking in the mesmerising vistas of the Marina Bay skyline. With the view providing a wonderful backdrop, the service is prompt, but never hurried nor intrusive, making for a memorable experience. There are only four tables of two by the floor-to-ceiling window. Book in advance if you’re aiming for a romantic evening. Head to the rooftop for pre-dinner drinks to soak in the breathtaking vista as the sun sets over the horizon. Singapore Tatler’s critics bring you the newest restaurant reviews.